Last week, when I assembled a sleep-steeped playlist, I realized that I failed to include one of my all-time favourite cartoons. And I'm glad I did because it helped me to remember a bunch of other all-time favourites (as is usually the case when I write this blog), and I realized we had the capacity to investigate another sub-genre of cartoon, which I've tentatively labelled for lack of a better term...the "in-and-outie". You know the routine. It's a classic set-up. Protagonists are given explicit instructions to keep quiet or stay out of sight. Then the antagonist decides he/she can't have that, and will do everything in his/her power to break that silence. After that, it's a 5 minute test of resilience as we learn the lengths that the poor sap protagonist will go to in order to stay out of trouble - even if it means popping off one's own head to go outside and belch. The set-up was basically the birth-child of gag guru, Tex Avery. He first established it in 1952's 'Rock-A-Bye Bear', where Joe Bear, voiced by Daws Butler (like Huckleberry Hound on steroids), is simply trying to hibernate in his unusually posh winter den. Spike, who is usually Droopy's foil, is put to the difficult task of keeping things QUIET! But his puny pound-mate aims to get him fired. Or just pounded in a different sense of the term. Speaking of job shake-ups, one of the last things Tex Avery did before quitting MGM was remake 'Rock-A-Bye Bear' as a Droopy cartoon. It's called 'Deputy Droopy' (1955) and it's one of my top 3 favourite cartoons of all time - superior to 'Rock-A-Bye Bear' in my opinion. If you can move past Droopy's suddenly weird low register, you'll find one of the funniest, most intense gag cartoons ever produced. Some of it's a direct re-hash of 'Rock-A-Bye Bear'. But all of the gag greats like Chuck Jones and Hanna-Barbera repeated themselves. It's all in the presentation. Like any good joke, sometimes it's worth repeating - but you can re-tell it in ways that make it sound fresh and funnier. Like the Road Runner and Tom & Jerry, 'Deputy Droopy' takes some well-worn gags and builds around them frenetically. It's relentless. And I love some of the daft animation and character designs. Note the sheriff's bow-legged swagger, or the way the 2 outlaw mutts meld into the walls as they sneakily slide out of the scene. I love the exaggerated lines of action that pop from gunfire and slaps to the dog's face. And how about that freakish, snake-like cat? Reportedly around the time he left MGM, Tex Avery, then in his late 50's, was prone to saying he was burnt out. Perhaps not surprisingly, within the one year he worked for Walter Lantz's studio, he made yet ANOTHER one of these "in-and-outies" - this time, as a Chilly Willy vehicle. (even though he barely appears in the film) It was called 'The Legend of Rockabye Point'. (1955) Perhaps not reflecting very well on the series itself, this rehash is easily the best Chilly Willy cartoon ever made. And perhaps not reflecting well on that particular year either, 'The Legend of Rockabye Point' was also nominated for an Oscar, but lost to Warner Bros.'s 'Speedy Gonzales'. Avery only made 2 Chilly Willy's - 'Rockabye Point' and 1954's 'I'm Cold'. Both aren't particularly inspired. 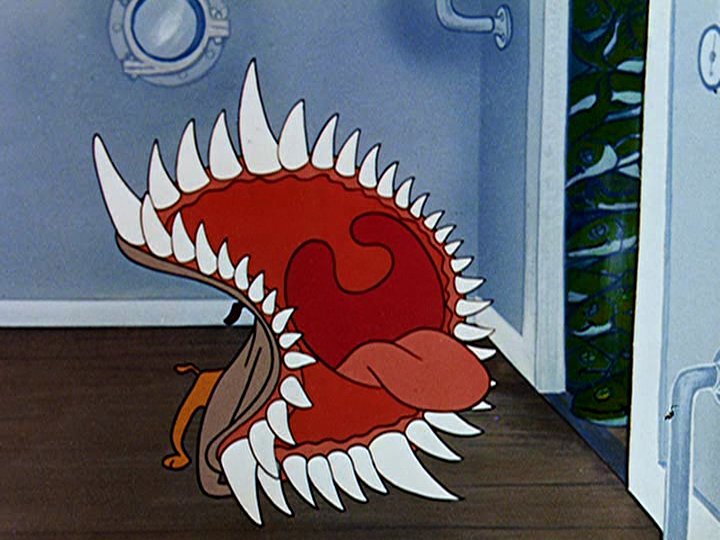 But even warmed-over Tex Avery is still better than 80% of the other cartoons out there - always with a moment or 2 of something amazing that you've never seen before. That unhinged dog jaw is a favourite example of mine. In an excerpt from Joe Adamson's "The Walter Lantz Story", animator LaVerne Harding recalled Avery teaching her that there was no reason why a jaw spreading 180 degrees, couldn't move to 270 degrees in a cartoon. "From then on, I remembered - just go as far as you can, and then go further," she said. Ironically, Avery's career didn't go much further after his brief stint at Walter Lantz. But his legacy lives on. And to me, these 3 films are highlights - even though they're still virtually the same short. Often imitated (like Tom & Jerry briefly did in 1958's 'Royal Cat Nap') but never duplicated - Avery's work, even the lesser, is always simple and stupendously funny, 50+ years later.